FBC Jax Watchdogs: Two Rivers Baptist Church Changes Name, Drops Baptist, Wants a "Fresh Start"
Will FBC Jax and Mac Brunson now change their names? A great blog underscoring the need for church transparency and congregation involvement. Two messages: 1)DON'T SIT IDLY BY AND LET YOUR CHURCH BE HIGH-JACKED! 2)STOP THIS BEFORE IT HAPPENS TO YOU! It's all about prevention. I hear it is about to get bad, real bad on many of these Baptist. But people like Sutton, Brunson, Everson, and many others deserve all the Busting they can recieve. I hope you never get over it and as a matter of fact hope you "get on it" ! I am afraid as far as Google is concerned their new name will soon be "burdened" with their baggage. As it is very easy to update the past blog posts (baggage) with old name and (aka) new name and this will make the crawlers to index the new name and correlate it with the old name. Boo-hoo-hoo, Mac Brunson called me a name, and it was even in the newspaper. Wow, talking about a cry baby. Grow up Watch dog and move on. You are such a baby. I know I am a post late, but just read the previous few. He has the patience of a man who lost everyone of his children, has his property taken, and had boils all over his body. That's the same patience that Tom has? The Watchdog who cries, whimpers and builds a website because one pastor calls him one name? That's the patience of Job? Wow Dee, which Old Testament do you read? I just read the PDF the first commenter posted the link to. Here it is again. Under "A Need for Change" it says, "There is a need to be one church, with one philosophy. This translates into having one service and one style." Our first service begins at 9:45 a.m. It blends the classic hymns of faith with some of today's praise and worship songs through choir and orchestra and congregational singing to flow into a message built solidly on God's Word. The second service starts at 11:10 a.m. It uses modern praise and worship with contemporary arrangements to set up a message from God's Word that speaks to where you are. The word "transition" appears 4 times in that document. Need I say more? Is "LIFE Groups" some new Lifeway or PDC term? Because I've sure been seeing it pop up in a lot of churches in the past few months, including Bellevue. It seems like there are always certain popular buzz words in churches that are being transitioned or have been fully transitioned, including "transition." While not our desire, if God leads you to another place we understand and wish only the best for you. Translation: If you don't like it, leave. Never mind him. He's carrying around a basket, and it's a few sandwiches short. No, he's not literally carrying around a picnic basket (I don't think), but you get the point. I pastored my first Baptist church in 1962.Before that i spent about 10 yrs in training. I am truly concerned and conflicted about what is happening in S.B.C. and other independent "mega" churches. Admittedly the largest church I have pastored had 800 on membership role. I have pastored 7 different churches. We have always had a monthly business session. There in plain sight is all salaries paid out and all church expenses. I don't understand those who don't want all information known. Is it because some pastors recieve so much that thay feel guilty? I don't have an answer but if the laborer is working hard enough he shouldn't be ashamed of his hire. I go to FBC Orlando. The "LIFE Group" name to us is just about making Sunday school MORE than Sunday morning. It's about living life together. After getting involved in one, the church didn't seem so big to me anymore. Regardless of the size of the church, I do believe that you won't really go anywhere fellowship wise unless you do more than Sunday morning service. I grew up in regular sized churches but my family only did the Sunday morning routine. We didn't really grow in our churches. Is it because some pastors recieve so much that thay feel guilty? No, they don't feel guilty. They feel entitled. The reason they guard that information so carefully is because they know the people paying their exorbitant salaries, the same people they're beating to give more to "God's work," would rise up in protest if they knew. No, they don't feel guilty. They feel entitled. New BBC Open Forum you are correct, power and influence can make some feel that they in gods will. No guilt if in the will of the creator. I thank God for my Pastor. He led our Church to quit singing boring Hymns and singing and start clapping and swaying and raising our arms on Sunday morning. He quit doing boring business meetings....if we need to know something, he told us he will let us know. He stopped visiting the hospital, he is too busy writing his sermon while witnessing to the Barista at Starbucks. He spoke last month on 6 steps to beating Depression, How to enjoy your wife, and 7 keys to making more money. He even uses the Bible! That old tired stuff doesn't work anymore. We need to appeal to the culture. Would Tupac want to go to Two Rivers? Regardless of the size of the church, I do believe that you won't really go anywhere fellowship wise unless you do more than Sunday morning service. I agree. I don't think it has to be a "LIFE Group" though. I've never found SS classes to be a good way to get to know people. I prefer a more mixed-age and diverse group. Of course, your experience may be different. But you do have to narrow your scope. That can be said of any place, including school, work, or your community. Some churches are just too big to ever feel like you're a part unless you get to know people in (I refuse to use the "official" term because it gives me the creeps)... shall we say a more intimate setting. In others, it's difficult to feel accepted unless you're a member of one of the "special" families. It's tough trying to fit into a new church, and I think the older you get the more difficult it is. When people have had long friendships with others, they're often not going to be very accepting to outsiders. I just wondered if "LIFE Group" was some kind of new "brand" that Lifeway or someone came up with. I had never seen the term until a few months ago, and since then I'm seeing it everywhere. It seems like too much of a coincidence for there not to be someone or something behind it. Thy Peace - I too am completely perplexed at their explanation of changing their name because it was "dragged through the mud" (quote in the paper) and "drug through the sewer" (on their website)....if that was any part of their decision, then they needed to completely jettison the "Two Rivers" name. Even "Dos Rios"...anything but "Two Rivers". I think that was just an excuse to help convince the peeps that a name change was in order to drop the Baptist name. If they truly, truly were concerned about people reading about their 2007-2008 debacle, they would have dropped Two Rivers completely. This idea of "fresh" started a few years ago. First it was to drop Sunday School to Bible Fellowship. Then it was to remove Baptist from the corporate name and insert Fellowship. Lastly, it was for the deacons to wear aprons when they took up the offering. What a change all in the name of "fresh". It never did appeal to me or some of the other deacons as well. If they truly, truly were concerned about people reading about their 2007-2008 debacle, they would have dropped Two Rivers completely. They've had one church split and lost a lot of members. It sounds like they anticipate another exodus. There were so many buzz words in that document. It's one of the most open examples of transitioning a church I've seen. I suspect they're almost there for them to be this open about their plans. One of the rules of transitioning a church is secrecy in the early stages and the "slow boil" approach. "I don't understand those who don't want all information known." Usually it is because they have something to hide. Is Your Church Being Transitioned? This is another sad example of a church dropping the " Baptist" name. This is a sign of the emerging church movement. We have all heard the calls for transparentcy and accountability. We need to add integrity and separation. Doctrine does matter. The one disadvantage I do feel I have is connecting with people of different ages. My group is age specific, so most of my friends at church are in my age group. One reason I like where I am now is because of the large singles group. In a lot of places (I've been), most of the resources are put into kids, college students, and married couples. My church has been using "Life Group" name in the 5 years I've been around. At the end of the day, it's Sunday School, but the classes also try to plan activities (mid-week Bible studies, social activities here and there) to get our relationships to go beyond Sunday. I don't like the idea of Baptists taking out "Baptist Church" from their name. Just clean up and move forward. The Catholics aren't doing it. I doubt it will make much difference. My pastor doesn't visit hospitals so he can share Christ at Starbucks. Wow, re-read that one. There are a lot of cry babies on this blog...a few Godly reformers, but mainly religious tear shedders. Some one give us a brunson foot stomp. There have been small groups as a formal part of church activities for more than ten years, sometimes called "life groups". In many places, these are groups that people choose to be a part of, that meet sometime other than on Sunday morning. Many churches have Sunday School classes and life groups. Many times, the life groups are formed around some outside interest, like the arts, or some cultural issue. Many share a weekly meal at the home of a member, do some study (usually biblicly based), and share about their experiences of the past week and prayer concerns. Can be a good thing -- fellowship and sharing in a smaller, house-church like environment. The name has already changed, but it is a secret! I don't believe that there is any reason why a church cannot change its governing structure, nomenclature, programming approach, music etc. If a church wants to do those things, fine. It is possible that churches can get caught up in chasing cultural fads when they do this. And they can come off looking cheesy. When we started our church 18 years ago there was another church start in another part of our state called "Contemporary Baptist Church." Not sure how it did. Hope they are going gangbusters. But the name, to me, gave the impression that they were trying too hard. A lot of what churches do nowadays looks like fad chasing. But it is also possible that resistance to change signals another set of problems in the life of a church. "Sunday School" is a relatively new term in the 2000+ year life of the church. "Baptist" is not an ancient term either. Two Rivers had different factions on these and lots of other questions. And they had some very "convictional" people on both sides of that. The lay leader of the opposing faction also played a big role here. That is not a good mix for peace. Is that link you posted a joke or is it meant to be serious? I can see some things in it that you would identify with, but it reads like some cranky member at the Westboro Baptist Church put it together. It doesn't read like anything you would put together. I am actually sympathy with those who oppose schemes to change churches against the wishes of its members. But if that is the example of what the opposition uses to oppose such efforts, it is no wonder churches opt for change. "Two Rivers had different factions on these and lots of other questions. And they had some very "convictional" people on both sides of that. The lay leader of the opposing faction also played a big role here. That is not a good mix for peace." The goal, Louis, for the Body of Christ is "spiritual unity". You need believers for that to happen. Let us strive for the real thing. Not the fake as so many have. No, Louis. That's not my work, and it wasn't a joke. I don't either IF a large majority of the congregation is on board with it. It's when a pastor and a few yes men decide to transition a church without a strong mandate from the membership that it becomes problematic. This is the whole idea behind "transitioning." If a group wants to make all these changes, they should go somewhere and start their own church. Don't hijack an existing church! And don't call it a "vision from God." That just insults your intelligence and mine. Someone once described it as follows in response to a request by Bellevue's new "director of prayer." (She replaced the "minister of prayer," Paul Williams, the child molester/pervert, but of course they couldn't bestow upon her the same title.) She said, "Pray for the commitment to the vision cast before us from the Lord through our pastor in sharing the love of Jesus with Memphis and all the surrounding areas in which we live." He asked, "Where has the Lord Jesus ever presented this doctrine? I mean, it's like Jesus is standing somewhere with a bow and arrow and attached to the arrow is this thing called a vision. Then Jesus releases the arrow and it zings through 'our pastor' and lands on the ground before us. As it lands we bow to it as a sacred 'message' from God. Do what?" This is why I asked about the term "LIFE Group." It just sounds like another fad, the latest buzz word in what has become an industry -- church marketing. People like your friend Maurilio are getting rich off the churches they purpose to rebrand. I dare say most of the people in these churches aren't even aware there's such a thing as a "church marketer," much less what these guys are being paid. It may or may not indicate a problem. If you're never willing to change anything you stagnate, so if someone is so deeply buried in a rut, that could be unhealthy. However, what we're seeing today is the total takeover and makeover of churches by pastors who want to be "relevant to the culture." The changes they're making are all about bringing in the "unchurched," and that's not the purpose of the church. The church is for Christians. The job of individual Christians is to go out into the world and reach the lost there, in the world. We've gotten lazy. Now we want to sit back and attract the "unchurched" with things that appeal to them "where they are." Churches have become like bug zappers. (Somehow I don't think that's what Jesus meant by being "the light of the world.") If that takes "cool, hip" pastors with bad haircuts, sloppy clothes, and culturally relevant "talks," so be it. If it takes alienating anyone in the congregation over the age of 40 and ditching hymns for tuneless 7-11 choruses and deafening guitars, then that's the price you have to pay. Of course, many of these guys are finding that it's those over 50 who were their giving base. So once they've run off many of the old fogeys they have to strive to bring in even more replacements to try to make up for the budget shortfall, and they're discovering that the younger generation isn't giving like their parents and grandparents. So now we're bombarded with "tithing" sermons. If they won't give willingly, beat it out of them. How's that working out for you, guys? One thing about the younger generation, a lot of them have the ability to see straight through all the feeble attempts to be relevant, and they're staying away in droves. As a result many of our churches have become irrelevant to everyone. In 2009, a member of the demographic group being targeted summed it up like this. Try to put yourself in the shoes of people who've been a part of a church for 30, 40, 50, or more years. They've invested their time, their money, their prayers, and often their sweat into an organization that is like their family. Then the new kid on the block (the new pastor) comes in under false pretenses and wants to change everything. He tells you if you don't like it you're free to go elsewhere. How would you feel? Or on a more personal level, let's say you invite someone to come live with you. At first everything is fine, but then one day he informs you you're doing everything wrong. The decor of your home is outdated, you're not serving the right food (even though you're feeding him at no cost to him), you're not listening to the "right" music or watching the "right" TV shows. Even your daily schedule is all wrong. Instead of getting up at 7:00 a.m., now you have to get up at 5:00 a.m. because he's bringing in his friends at 7:30, and you have to be out of the house before then if you don't like their music, etc. That is a good description of what has happened in many churches today. Can anyone relate to that at all? 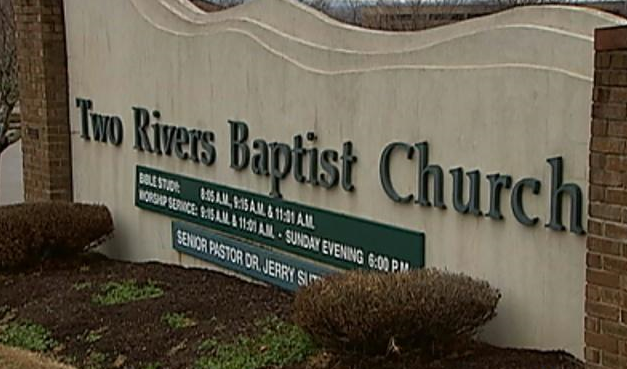 Plenty of other Baptist churches have renamed themselves, but what makes this one particularly interesting is that Two Rivers has been “the home church” for many of the high-honchos of the Southern Baptist Convention, which has its headquarters in Nashville. If you were talking about this link, that's straight off Rick Warren's pastors.com site. The links to the other parts at the top of later parts no longer work. The six links above are the direct links to the six parts. After reading that (and refreshing my memory), I think they just need to shutter and fumigate the place and disperse. Maybe sell it to the Opryland Hotel if they're still interested. Just an update on your story. Jerry sutton has resurfaced at Mid-Western Baptist Theological Seminary. He is going to be an associate dean and a Vice President at the seminary. Patterson is one of the best con men we have in the SBC. Guys like Brunson and Gaines learned at his feet. Look at where Ken Hemphill ended up. With a cushy 6 figure job for a program we don't need. ehte"Of course, many of these guys are finding that it's those over 50 who were their giving base." Bingo. The problem is very simple. They need younger folks to stay alive in the future. They need older folks because they "tithe". The Body of Christ should not be about relating to age. We are to be united spiritually whether 20 or 90. But this is the problem with the "instutition" we call "church" but isn't. BTW: Change for the sake of change is silly. Being resistant to change can be good depending on the situation. Too many are making changes to leave their mark. Everyone wants a legacy these days. Ego. Was anyone around when "DNA" was the big buzz word in mega's? This touches upon what I alluded to before about "small groups." 7. They form small groups on purpose: Purpose Driven DNA is implanted in every cell (group) of the congregation. Each small group helps the members fulfill each of the five purposes in their lives. The goal is to help every believer live a purpose driven life. From The Characteristics of a Purpose Driven Congregation, by Rick Warren. I would argue that the real goal in the PDC is to achieve what they call unity which isn't the biblical definition of unity but rather a blind, unquestioning, fall-on-your-sword loyalty to the pastor and the brand. See groupthink. Out of curiosity, are there any changes in the church that you guys like or do you think we should just keep operating like it's 1950? Your mindsets are exactly why churches are dying, especially Baptist ones. This has your stomach tore up??? Dropping Baptist from the name?? Dog you been parked near too many fire hydrants. This ain't worth wasting your koolaid on. What has happened to feeding the sheep and reaching the lost? I think we have made something that should be easy into something difficult. "Out of curiosity, are there any changes in the church that you guys like or do you think we should just keep operating like it's 1950? Your mindsets are exactly why churches are dying, especially Baptist ones." Your mindset is why I and most of the people I know who are over 50 don't go to church at all now. See how that works? You are kidding me, right? Churches are dying and it’s our fault. That is hilarious. You disrespectfully show people the door and it’s our fault the churches are dying. Every church I know of that has gone the PD transition route is at least one third smaller than before they did the PD thing. That is the real cost of making change, in people, in souls, in seekers whatever you want to call it. You change the name or delete the name as much as you want what difference it make if the change is not for the better. Why make the change? The paper reported that Two Rivers used to have over 3,000 attend on Sundays now it’s around 600. Here’s a clue. Stop making church about the preacher, instead do it the old fashion way and make it about the members. Are there changes I like? Yes, I have no objection to any of the changes that you guys trumpet as being new and improved. The strange thing is these so called changes are the same thing that was around in the 60’s and 70’s and probably before that; I was not around so I don’t know. A scientist goes into a laboratory and takes out a frog and yells, “jump, frog, jump.” The frog jumps four feet which the scientist dutifully records. The scientist then takes a scalpel and cuts off one of the frog’s legs and yells “jump frog jump.” The frog jumps three feet and the result is record. The scientist then cuts off a second leg and the frog jumps two feet. After the third leg the frog jumps one foot. The scientist then cuts off the last leg and yells “jump frog jump.” The frog does not move so he yells again and again no movement. The scientist yells three more times and still does not move. Realizing that the frog is not going to jump the scientist takes out his pen to write down his conclusion: Frog with no legs cannot hear. Just like the scientist you guys look at the evidence and come to the wrong conclusion! That’s another thing that sticks in my craw. Everyone says it’s the 50 and over who object. There are plenty of young people who object too. I have a 17 year old who will not go to Sunday school, or whatever we are calling it this week, and I can name at least a dozen of her friends that feel the same. Out of curiosity, are there any changes in the church that you guys like or do you think we should just keep operating like it's 1950? I think a more important question is why "church" has suddenly become irrelevant. I don't remember any "turf wars" between my generation and that of my parents over the music or the preaching or any of the things that they keep telling us are old-fashioned and irrelevant to young people today. FWIW I don't think this is true of all young people, as I have friends with teens who can't stand the "contemporary" services. As for going back to the '50s, I'm thinking more like '60s or early '70s. There was some good sacred music written during that time that I'd hate not to hear anymore. There's been some good stuff written since then, too, but the bad has far outdistanced the good IMO. I'm also glad the dress code has relaxed although I think we passed the tipping point several years ago. Does anybody own an iron anymore (that they don't just use for a doorstop)? Is it a result of the computer age and that it seems to take bigger and flashier things to entertain us? It's an honest question. I don't have the answer, but I think Anon 10:30 makes a good point, and that is that we're trying to make this all too complicated. Life is complicated enough already. Your mindsets are exactly why churches are dying, especially Baptist ones. Dare I ask what they're doing in SS (or whatever they're calling it this week) now? This is just a guess, but I bet nobody has called to find out why she's not there, have they? You could never darken the door again, and absolutely nobody would care, but doggonit, those offering envelopes are going to arrive in the mail every month without fail! Turnyoureyeballs is either a really immature, spiritual sophmore or a troll just baiting the blog here. I suspect the former. He probalby received plenty of coaching from the likes of the emergent church, Porpoise Drivel pastor types. He is gonna be a real leader in the world, ain't he? Umm Huymmm. The failure by church members to make necessary changes in the 60's and 70's are the very reason the church is falling apart today. We've done calendars, budgets, programs, Sunday School, worship, everything the same way for 40 years. That failure to change has killed the Baptist church. Music is a great example. We sang the same songs for how long? 40 or so years. How is that a good thing? It's not. Sunday School was done the same way for how long? Look what that's gotten us. Yes, change has to come and it has to be dramatic because no change happened for such a long time. If you do not like it then tough. The bleeding has to stop. You guys and your refusal to make change is why things are the way they are today. Yes, you'll deny it and have some wonderful things to say about me but the truth is the truth. You've been whitewashing the walls for too long and now they are coming down on you. Blogger said: "should we keep operating like it is 1950?" Answer: People actually got SAVED in 1950!!! The GOSPEL of Jesus Christ was preached in 1950!!! Today we have the celebrity showman and his minions accomplishing nothing spiritual just making money and living the "grand" lifestyle. You are exactly right we left and absolutely no one called. But that was what was communicated, but never said, from on high, wasn’t it. If you don’t like it, leave. My daughter attends church and is active in the more adult groups but she was so put off by the silliness of the youth ministry at Bellevue she wants nothing to do with any youth ministry. She has a perception and understanding that is far beyond her years and can read people minutes after meeting them. Maybe they should do like Junior Hill said at a Pastors Conference. "If you are too ashamed to have Baptist in your church name - CHANGE DENOMINATIONS!!!" Shall we write a new Bible, too? I mean, parts of that old thing are thousands of years old! Look, I have nothing to say about you. I don't know you. But you don't have to worry about me and my family spoiling your fun anymore because we've left and taken our money with us. Enjoy! I have to admit there's less stress in my life now that I've taken off the blinders. It's very liberating. You should try it. "Is it a result of the computer age and that it seems to take bigger and flashier things to entertain us?" Isn't that the root problem? People expect to be entertained at church? "Yes, change has to come and it has to be dramatic because no change happened for such a long time. If you do not like it then tough. The bleeding has to stop." Soooo...the reason people are not there is because they don't like the music and the other entertainment? And this has to do with Jesus, how? It is truly scary what people believe is the Body of Christ. I would guess the 1st Century Christians were considered blessed if they had a lute. We did? Could have fooled me. I have been through more changes than I can list. Some were good, some were bad and some were just plain stupid but that’s alright, that’s just life. Some I liked some I didn’t like but that was alright I could disagree and still love and be loved regardless. We never did just the same old music there has always been new music to do. The problem is so much of the so called new music is, frankly, stale, it’s the same old tired tune over and over again just with different words. And then there is the fact that no one knows the words or the music. I was in a church that was in the process of being transitioned. This church was once a vibrant and growing fellowship that used to have in excess of a 1,000 in attendance. The attendance had dwindled to below 200 but that didn’t matter because “we have to transition or die.” (Seems to be the mantra doesn’t it) This church no longer met in the main auditorium; instead the numbers were now so small they met in the chapel. We were in the song service trying to sing to the CD playing from the sound system but no one knew the tune and no one knew the song; not even the praise team who had the music sang the song. Eventually everyone gave up and just stood waiting for the song to end. The preacher got up and talked about what a blessing the song service was. I was thinking what are you talking about you have to live in a different reality than I do, nobody could sing the song. Anyway, it’s not the music and it’s not the clothes, it’s the hard hearted “if you don’t like it, leave” attitude that I object to. What kind of a loving spirit is that? Why do you want to go to a church that places such a low value on souls? It’s the preacher said it and I have believe and obey it regardless of what the Word says attitude. No offense folks but he is just a man and only a man he understands like a man. He has not received some kind of a super spiritual cybernetic implant that allows him greater or more intimate contact with God. Andrew and Turn ur eyes would benefit from a study on why I am no longer a SBC'er from David Cloud at www.wayoflife.org. This is a pastor that still has it right. His positions are unpopular but grounded in the word no matter how tough. Check out the apostacy data base. You ask about Jerry Sutton??? Did you know Pastor Sutton? Were you directly involved in what was happening? He was not for changing the church format from traditional to contemporary, but agreed when the majority wanted to. And he happily admitted he was wrong when the church flourished. As the controversy with the financial records, the church was willing to provide the documents but would not produce protected member information. The courts agreed with the church. The church overwhelmingly agreed to drop the matter and to keep Pastor Sutton as their leader. Yet the minority continued to create waves after the matter had been settled collectively by the courts AND the church members. Pastor Sutton chose to leave because he knew he was no longer effective in light of the controversy. He left in the best interest of the church, not himself. Why does the majority suffer for the minority? Shame on the few who were not satisfied with the initial decision. If they were so unhappy, they should have left...not Pastor Sutton. I miss him and his leadership. And I have left Two Rivers Feel Good Church where we compromise what we stand for to be sure everyone is happy. I wish them well, but I am more concerned about the direction they are taking now than when Pastor Sutton was leading. He was clear on what he stood for. And if I am wrong, that I will stand corrected but having been there during the controversy and aftermath, I stand behind Pastor Sutton now. Isn't there something to be said for integrity and accountability? One person and organization has won and kept my respect for years. When Billy Graham first began his ministry, he set high standards which anyone would be wise to follow: (1.) His personal morality was a primary concern. For that reason, he never was with any woman alone (who wasn't his wife). Someone was always present. (2.) With the Board of Directors/Advisors that was formed, there was strict financial accountability. Budgets were set by local committees. Public audits of how money was raised and disbursed were published after every crusade. The Team members salaries were fixed by the Board, so there was no possibility of abuse of the earlier evangelists who swept in, aroused a congregation, then left with lots of "love offerings." In my opinion, the money raised by the Church demands accountability. Members deserve to know, and anyone who denies their right to that information is either incompetent or ignorant. In any event they ought to resign (not those who ask for information. I have to agree with the Anonymous comment that began "Did you know Pastor Sutton?" It's a more accurate statement of what happened. The media tried to villianize the pastor and make the 80 look like a wronged minority. I'm not saying the pastor is/was perfect, but nothing illegal was done. With that being the case, it should have been handled as an internal church matter. To sue your church in court because you're not happy about how money is spent is ridiculous. Particularly when the church is following it's own rules for approving spending. The church protected the privacy of it's members, but did allow the 80 to review all other financial records, even posted them on the website for a time. The church willingly submitted to an audit that revealed nothing amiss. The judge threw out the lawsuit twice. There certainly were lessons to be learned from that mess, and I do agree that transparency and accountability are important. (Something the current Two Rivers admin should remember.) However a LARGE part of the problem was how the media sided with the unreasonable demands of a small minority. Many people did leave the church because of the confusion/fighting, but this also coincided with a significant spike in gas prices which left many people looking for churches closer to home. There were issues the church had and should have dealt with, but the overblown lawsuit took attention and energy away from dealing with real issues in a productive manner. I do agree it's important to be transparent and involved, but you don't deal with family problems by calling the law or the media unless something illegal is going on. If you care about how your church spends it's money, show up for finance meetings and volunteer for committees, or at the very least start a dialogue with someone who handles the finances. After living through the TRBC debacle personally, I gave up and left in 2010. I've kept up with some people and am not surprised in the least that the church is once again in dire debt in the wake of Mat Surber's leadership and is now up for sale. The moment I heard Sutton was being sued I knew he should step down. Instead, he fostered such a horribly destructive environment that some survivors will never sleep well again. Oh if you all only knew that Matt Surber is doing the same to Castle Hills First Baptist Church in San Antonio, which has a very successful school attached to it. Much to Surber's chagrin though. First he dropped the "First Baptist". Called it Castle Hills Church, then suddenly had a vision to SELL the property (est. 1955), by brainwashing the remaining congregants into his...oh I mean into "God's vision", "God's will". Resents the school. Doesn't believe in Christian education. Sound familiar @CentralChurch School in Memphis? He uses manipulation, a self-appointed group of "yes-men" elders (that he implemted) to support him, and flat out lies. People are leaving in droves, but not before he tries to dismember a wonderful historical church. But hey...it's 2 years now. Time for him to abandon the members and move. I mean isn't that his M.O. ?